You have all the equipment and software but you're still not getting professional results in audio engineering? This is a very common problem and you are not alone. But if you can hear that your recordings are not sounding professional yet, then you have at least made a start. Audio engineering is a skilled trade that deals with the use of equipment for the recording, mixing and reproduction of sounds. The field draws on too many artistic and vocational areas, including electronics, acoustics and music. An audio engineer is proficient with different types of recording media, such as analog tape, digital multitrack recorders and workstations and computer knowledge. With the advent of the digital age, it is becoming more and more important for the audio engineer to be versed in the understanding of software and hardware integration from synchronization to analog to digital transfers. The first problem that many newcomers to recording have is that they think there is something wrong with their equipment or editing software, and that is why their recordings are not good enough. But these days, everyone can have access to professional quality equipment and software at a reasonably low cost. So if you have a quality microphone an audio interface and recording software such as Audition, Cakewalk, Cubase, Digital Performer, Logic, Pro Tools or similar, then you have everything you need to get started. Some engineers don’t know how to get the best out of your recording environment. We understand that not everyone can have pro studio surroundings. You don't need pro studio surroundings to get good results, but you may have to use a little initiative. We will listen carefully to your recordings and advise you on exactly what you need to do in terms of soundproofing and acoustic treatment. You may not have to do anything at all, other than find the exact place in your house or apartment that has the best sound! Audio engineering concerns the creative aspects of sounds and music, in contrast with the formal audio engineering discipline known as acoustical engineering. Producer, engineer, mixer Phil Ek has described audio engineering as the "technical aspect of recording the placing of microphones, the turning of pre amp knobs, the setting of levels. The physical recording of any project is done by an engineer, the nuts and bolts.” Many recording engineers also invented new technology, equipment and techniques, to enhance the process and art. Firstly get the basic knowledge for the web using the video tutorials, E-Books, online lessens. So if you are ready to start making professional recordings go ahead. Best Regards! 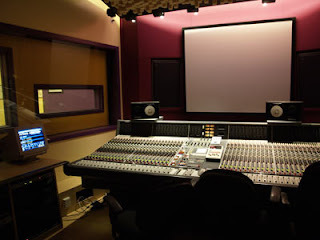 Audio engineers in their daily work operate and make use of these Equipments. Digital Recording Equipment .. By god its very big in Size..
You mean, this post big or what?